Discover and browse all the e-bulletins published by EOSE in 2015 – ranged from newest to oldest. EOSE also sent Season’s Greetings to the whole sector on this occasion. With the start of a new academic year, EOSE is delighted to introduce a bunch of activities that will hopefully form a new wave for the sport and active leisure sector. 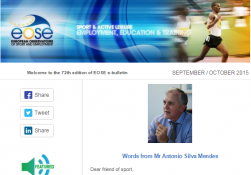 This includes an exclusive interview with Mr Antonio Silva Mendes but also news about an initiative towards the recognition of informal and non-formal learning in and trhough sport, EOSE regional and national activities as well as a new project in Golf. Welcome to the Special Edition of the EOSE E-Bulletin devoted to the concept of Learning mobility. This bulletin will provide you with valuable insight as regard the Feasibility Study conducted in 2013 but also priceless feedback on concrete mobility experiences as well as some tips regarding funding opportunities. Enjoy the read! At the down of a hot summer full of major sportive events and crucial deadline for European sport organisations and policies, EOSE’s May/June e-bulletin brings you the latest development in the sport and active leisure sector. It also introduces the social media campaign on mobility and skills recognition with #MobilitySupPORTjobs and #SkillsSetMatch as official hashtags. Spring always brings changes and renewal. This is one again the case for EOSE and the sport and active leisure sector. That is the reason why we delighted to emphasise 3 key infos embeded in the issue: the first overview of the Feasibility Study carried out in 2014 in relation to the setting up of a Sector Skills COuncil for the Sector, an exclusive interview with MEP MArc Tarabella as well as the results of Collaborative partnerships in the sport field and Non-for-profit European sport events related to the European Week of Sport as per the Erasmus+ Sport Chapter. With a new year ahead, EOSE introduces its new developments in terms of communication and activities meant to serve one simple goal: facilitating and supporting the development of the sport and active leisure at best.